When I think about Traveller, I almost always think of J. Andrew Keith and William H. Keith, known fondly among fans of the game as "the Keith Brothers" (which is only apt, since they were in fact brothers). The reason I think of them is that much of the best material written for Traveller during its Golden Age was the work of the Keith Brothers, often writing under pseudonyms. The reason for this is that they were so prolific that their publishers were concerned about the appearance of using these two authors again and again, but their material was so good that the publishers could hardly turn down their submissions. In addition, William H. Keith is an illustrator of some talent, so not only could the Keith Brothers produce high quality rules and adventures, they could provide the art for them as well! 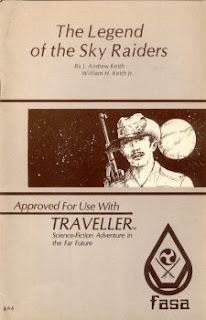 I'd be hard pressed to choose a single Keith-penned adventure as my absolute favorite, but, if pressed, I'd probably pick 1981's The Legend of the Sky Raiders, published under license from GDW by FASA in their pre-Star Trek, pre-Battletech, pre-Shadowrun days. The first part of a trilogy of adventures, The Legend of the Sky Raiders has a terrifically pulpy feel to it. The characters are hired by a young archeologist looking to continue her father's research into the origins of the mysterious interstellar warriors known as the Sky Raiders. According to the archeologist, the Sky Raiders originated on the backwater world of Mirayn, where the adventure takes place, and she needs assistants and guards to aid her in proving her father's theories, thereby solving a great historical riddle. Of course, many dangers await the characters: from the harsh environment of Mirayn's Outback to the native sophont species to other humans who don't want the archeologist to proceed with her investigations. The Legend of the Sky Raiders pretty much encapsulates everything I like in my Traveller adventures. There are equal parts action and problem-solving, set against a backdrop in which human greed and rivalries are every bit as dangerous as any alien obstacles the PCs encounter. The adventure also nicely mixes the low-key with the epic. The archeological expedition is a surprisingly modest affair, but the implications of what the characters discover are far from modest -- implications that are explored more fully in the next two adventures in the series. Keith Brothers adventures were what I'd call "slow burn" scenarios: it took a while for them to get going, but, once they did, you were in for a bang. That's still my preferred approach to SF adventures. Much as I love wild, over-the-top craziness, it's hard to maintain for very long, which is why I prefer adventures that are willing to move slowly and save the big bangs until lots of details have been firmly -- and carefully -- established. Even back in the day, there were some who found the Keith Brothers adventures a little too sedate for their tastes, but I wasn't one of them. In a very real way, the look and feel they established through their many adventures, supplements, and articles was Traveller and I'll admit that I've often found it hard to accept other interpretations of the game in the years since. That's why I particularly treasure my large collection of Keith Brothers products. Even three decades on, they still inspire me in ways that few others do. From your description, the adventure has a very H. Beam Piper feel to it, which I suppose shouldn't be surprising, given Traveller's roots. I loved Legend of the Sky Raiders. It was my favourite Traveler adventure, ever. I had the series for years. Got all 3 books for $1.00 a piece. I ran the first book, but made the mistake of not really reading the adventure to run it properly. Also what is funny, is the main npc, the archeologist has a portable computer that is carried in a backpack and weighs 50kg! "The Slow Burn Theory" -- I like it, a lot. It is the grit and the fact the future is not squeaky clean - say like Star Wars is. Traveller is all about the Greys and Shadows - where players must frequent to get the job done. That is not to say there is not a moral core in Traveller - there is. The FASA Keith contributions are more freewheeling than their GDW counterparts and hopefully will get reformatted and retooled for Mongoose by the surviving brother. I'll confess that I'd never even heard of this book, but now I want one! Loved Sky Raiders. I'll never forget buying it by accident in a manner of speaking. I saw the FASA logo and assumed it was for Star Trek. I've run it (modified of course) for Star Trek, Traveller, Star Frontiers and Space Opera. Excellent stuff. Would love to see more work by the surviving brother. My own favorite series from the Brothers was the "Environment" series. The adventures are entertaining (I'm especially fond of the desert one, Duneraiders), the supplements are inspiring, and the art is of the usual Keith quality. One of these days, I hope to find one of the extremely rare The Arctic Environment which received such a limited printing from an obscure company. "The reason for this is that they were so prolific that their publishers were concerned about the appearance of using these two authors again and again,"
Strange to think of it like that. At White Wolf, we tend to be very happy when we can use authors again and again. Of course, publishing (roleplaying or otherwise) was very different in the 1980s. Stephen King adopted an alias because his publishers thought it looked bad for an author to have more than one book a year. William H. Keith Jr. was only known to me as a prolific sf writer who had a lot of pseudonyms (Ian Douglas, etc.) I might have one of his Dr. Who gaming books around here somewhere. His Wikipedia page doesn't seem to mention his gaming materials at all, and the bottom of the page doesn't list him as a game writer. It does list his novels and short stories set in game worlds, but otherwise, nada. His homepage does include his gaming materials prominently, so it's a bit of an oversight.